For the second time this week, a new Bones episode takes to the airwaves, launching the show's move to Friday nights. The early years of Bones were spent moving from one night on the schedule to the next, like a vagabond. For a time, they enjoyed a regular slot on Thursday nights and held their own against bigger shows on rival networks. More recently, they inherited the Monday slot from House, and there they not only thrived but grew. All throughout, the fanbase has stayed and moved right along with them and there is nothing to suggest anything different will happen this time around - especially since the move was well advertised and promoted by the network. For a first offering on a new time slot, 'The Fury in the Jury' isn't a bad one and even gives a new angle for the title character to work from. We've seen Brennan (Emily Deschanel) in front of the jury a handful of times over the last 9 seasons, as well as serving as a witness during her father's trial back in season 3. So it's interesting here to see her not as part of the prosecution or defense, but as a juror. Her fellow jurors are rather flat and two-dimensional, but that's okay because they don't get as much screen time as you'd expect (especially when it's announced that the jury will be sequestered). The writers aren't nearly as concerned with the circumstances as they are with the verdict. Or rather, Brennan's impact on that verdict, shifting the vote from 'guilty' to 'not guilty' because the prosecution failed to produce evidence beyond a reasonable doubt. Angela (Michaela Conlin) is upset by this, but it's exactly the same technicality that kept Brennan's very guilty father Max (Ryan O'Neal) off of death row years ago, so it tracks that this is the logic Brennan would apply. What Brennan can't realize because she's sequestered is that her team is working on solving the murder of another victim: the missing key witness from the trial. Where Brennan's side of the story is interesting, this one is hampered by the choice of squintern of the week Daisy Wick (Carla Gallo). Always overly perky, she takes annoying to a new level this time out by adding a thick layer of insecurity to her personality, making every scene she's in painful to watch. Fortunately, Brennan returns to the lab before long and quickly puts Daisy back in her place. Aside from Daisy, everyone else makes this a nice ensemble piece. Booth (David Boreanaz) gets to play concerned husband sprinkled with some good FBI Agent moments. Sweets (John Francis Daley) has his own superb scene where he turns the accused's sister into a weeping ball of frayed emotions. Meanwhile, Hodgins (TJ Thyne) does his part in the lab while his wife splits her time between the case and tracking down the person who stole Cam's (Tamara Taylor) identity back in episode 2. From a plot perspective, this is one of the more solid cases that the team has worked on. Unlike on Monday's episode, there's a sense of empathy for the victim and the killer is a slime bag, albeit a slippery one. Also, it's not often that Brennan makes a wrong call that she has to work hard to correct. 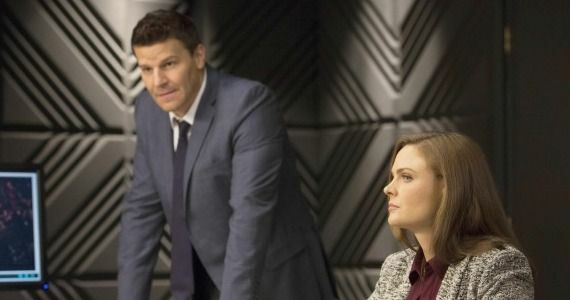 The final interrogation scene is one of the best between Boreanaz and Deschanel this season and the ending pushes the Cam story forward and gives it a twist by revealing that the thief is someone she knows. What did you think? 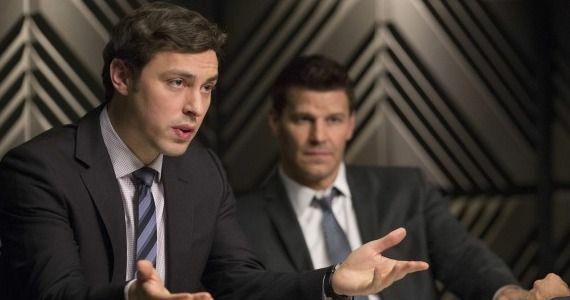 Is Bones worth giving up your Friday night for or is it heading to your DVR? Did you enjoy 'The Fury in the Jury' or 'The Dude in the Dam' more this week? Do you think Cam's old college roommate is tied to the serial killer that Pelant (Andrew Leeds) hinted at before his demise? Bones returns next Friday with 'The Mystery in the Meat' @8pm on Fox.